4.Generous cup of sugar - any of the following...maple syrup, honey or brown sugar. Mix the salt and pink salt together well. Rub the salt mixture into, and all over, the meat (all sides). Next slather the honey, maple syrup or brown sugar (whichever sugar mixture you're using) into the meat as well. Put in a zip-lock bag (or large tray) and set in the fridge for a week, turning once a day! After a week you can remove it from the bag and rinse off the excess salt, then let it soak in cold water for 30 min. Fry a piece up and taste. If it's too salty you can soak it in cold water for 15 more minutes before trying another piece. If it's still too salty soak in cold water for another 15 minute increment, using a fresh batch of cold water. You can now dry it off with paper towels, cook it and eat it like this, or you can smoke it right away, or let it sit on a cooling rack atop a baking sheet in the refrigerator overnight, to form a pellicle. 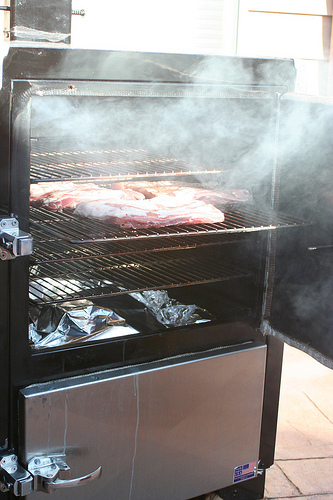 When it's time to smoke I've seen people recommend bringing the smoker temp up to 150, 175 or 200. If you can't keep your smoker under 225f I wouldn't worry about it. Just take the belly out once the internal temperature has reached 150f. To load the smoker with fuel in my BackWood smoker I just put two pieces of lump, lit it with a torch and then placed two pieces of apple wood on top of the lump. I usually smoke my bacon at 150-160f. Next you can let the bacon cool down before proceeding. Be cautioned...waiting can be difficult and you may end up with burnt fingers. If this happens simply proceed to lick your fingers of all bacon drippings. This won't help the burns...but it sure will taste good! Here's a picture of what looks to be a single belly cut into thirds. The most I ever did at one time was six full bellys...that was too much to do at one time. Skinning and slicing that much was a pain! Here's my latest batch. I prefer just a very simple cure and smoked this batch with Peach Wood and finished with just a bit of Cherry Wood. Bacon has been on my list for far to long. Yours looks great. Every time I buy or use bacon I tell myself again that I need to try to make some. Oh, you guys just have to do it. Start with one full belly. It will probably be easier to get it with the skin off, but that's up to you and your knife skills. But I'm thinking if your learning something new already, just get skin off the first time. After you get your belly you can follow the simple instructions for curing a pork belly for bacon, here is my recipe. Any questions just ask here and I'm sure one of us will get back to you in a timely manner...it really is worth making your own. Plus, it's pretty easy...it's just takes a bit of time to do the cure. Folks I have to call a large word of caution in the recipes I have seen here! According to the package and everything I have ever read on the subject. For cure #1, 1 teaspoon per 5 lbs of meat! This is really important, 1 tablespoon in 5 lbs of meat is dangerous and possibly deadly! I cannot stress this enough, this is very dangerous!!! I have seen three posts in this thread listing tablespoons of cure without a reference to meat weight, this is too dangerous to take a chance on someone misunderstanding. That's a real good point Mark, I didn't catch that when I went through the thread. I'm sure it will get corrected. I fall into the group of using 1 teaspoon per 5lbs of meat, though I usually phrase it 2 teaspoons in 10lbs (because a common belly will weigh 9-12 lbs. Dave, this is where you have to be careful with Kutas. There are numerous glaring errors in his use of cure. It is necessary to calculate the amount of cure for yourself, always. And always list it as amount of cure per pound meat. The recipe you reference is for 45 to 50lbs of bacon but someone starting out could easily misunderstand that and use it for 10lbs of bacon. That would not be a good result. When I post a cure recipe, I list the cure but not the amount used for that reason. It is consistent in being aa #cure to lbs meat ratio. I am working with a fresh 5.25 pound fresh pork belly that already had the rind removed before purchasing. NOTE: these measurements are per pound of fresh pork belly. Mix the spices together. The amount and type of spice one uses can vary according to personal tastes but the amount of Morton curing salt should not be altered. Place the pork belly in a zip lock bag and press the spice mix into all surfaces of the pork belly. Remove as much air as possible from the bag and seal. Place the pork belly in a fridge that has the temperature set to keep the meat in the range 34 -38 degrees F. Flip the bag over every day for 5 days. You will notice when you flip the bag for the first time that there will now be liquid in the bag, which indicates that the curing process is underway. Do not drain the liquid from the bag, this liquid brine is important to the process. After 4-1/2 to 5 days remove the pork belly from the bag and rinse well with cold water. Place the pork belly in a large non-reactive container, fill with cold water. Let sit in the fridge for a couple of hours, drain the water and rinse again. Repeat the two hour soak out and rinse at least three more times. This is a total of 8 hours of soak out time, and 4 changes of water. If your timetable is such that you would rather soak out the bacon overnight (10 or 12 hours), do at least 2 soak and rinse cycles. The soak cycles will remove excess salt, and don't be concerned if the bacon looks slightly pale. Once the soaking out process is finished, dry surface areas of the pork belly and set it uncovered on a rack in the fridge so the air can flow around the pork belly. This resting time will help equalize the liquids within the meat and also help with the pellicle formation which in turn will help the smoke adhere to the surface of the pork belly. The rest (or equalization) time is a minimum of 8 hours, but can be extended to 24 hours if needed. Usually I use maple lump and I use cherry wood for the smoking wood. Insert a thermometer into the thickest part of the pork belly. When the grill temperature is about 140 degrees F the pork belly is put on the grill indirect. The temperature is kept in the 150 – 180 degree range for 2 hours or so and then allowed to creep up to 200 degrees F over the next couple of hours and then to 220 degrees F until the internal temperature of the meat is 150 degrees F. At this point the bacon is removed from the grill. Allow the bacon to cool overnight in the fridge before slicing. It is delicious so don't be shy and give it a whirl. It's sweet with light maple tones, aromatic cinnamon kick and excellent salt balance. - Mix everything together then rub it on the pork belly evenly on all sides. Place it in a large ziplock bag and allow to cure in fridge for 5 days between 36F - 40F. Turn over once each day. - After 5 full days rinse thoroughly and soak in clean cold water for 15 minutes, remove and pat dry with paper towels. - Place pork belly in the fridge uncovered on a rack and allow to dry overnight for an equalization period and to allow pellicle formation. smoke at 160 - 170 F for the first few hrs then ramp up to 200F or so to finish. My wood choices are usually hickory for the first 2 to 3 hrs then switch to apple, cherry or maple to finish for excellent rich color. b. Buckboard garlic, sugar and pepper cure. 2. I have to find a way to cut down the salt in the initial cure recipe..wound up soaking one batch over three hours and12 water changes just to get it to where I could choke down the sample fry. 3.Don't bother putting pepper in the basic cure...only thing that came through was the garlic and salt when testing the buckboard...more experimentation is warranted ...time to try either pastrami or Canadian bacon. Thanks for stopping by to check out my Q-View. Dave the reason your bacon is so salty is that you are using the ingredients for probably 5 slabs of bacon on one slab. All of the amounts are for about 45 to 50lbs of bacon. Luckily you rinsed the stuffing out of it as that is enough cure for 45 to 50 lbs. Yes I make maple cured bacon, I will post my recipe if you wish. I have never had a problem with salt. I have never had to rinse my bacon. I'm not listing the amount of cure #1 so you have to calculate it for the weight of meat. Ok, in Hoser's defense - He is using what should be a tried and true recipe, except for a few things. 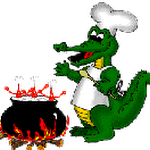 This recipe is in the last edition (4th) published in 2008. Rytek died in 1996 and this recipe was not in HIS book when he died, only the last edition. It is not in the first edition as I have that also. In looking at the recipe, Kutas always listed the amount of meat at the top of HIS recipes, usually in 100 and 25lb versions. That is not present here. The recipe is not complete in comparison to Kutas's other recipes. It looks to me that some of the title information is missing and a few paragraphs in the method. My best guess is that this was for 5 bellies or 45 to 50lbs. These would be stacked on top of each other, wrapped in plastic then refrigerated for the curing time period. My best guess. This is not one of Rytek's recipes, something added later by...someone else incomplete. Still there are errors in Rytek's recipes in cure amounts. Cures changed over the period of time he published (1976 to 1996 to present) and the book did not always keep up. You can find reference to that in the end of preamble in Edition 4. There are also four different % of nitrite cures available on the market - 5%, 6%, 6.5% and 7% (not including TQ). You really have to read and follow the cure package instructions, not the recipe. You have to calculate the cure for yourself to be safe. Dave it was not my intention to attack or offend you in any way, if I have done so I apologize! You, Sir are a damn fine cook and I would dive into any other thing I have ever seen come out of your kitchen. Mark....no offense taken believe me, and after re-reading Rytek's recipe several times I have to agree that it must have been a misprint that the editors did not catch. Pretty sloppy editing in my opinion. Let's just say that one should always...always weigh the meat carefully and compute the cure for each recipe as you go. The original post has been edited to delete the amounts used...we'll let future readers learn and measure their own. For Atlanta folks I sometimes get my pork belly (uncured bacon) at the Buford Hwy Farmers Market in Norcross. Hi, Thecueman - Welcome to the FotW Forum, and thanks for providing this information! Feel free to drop into the New Members' Lounge and introduce yourself, if you would like!